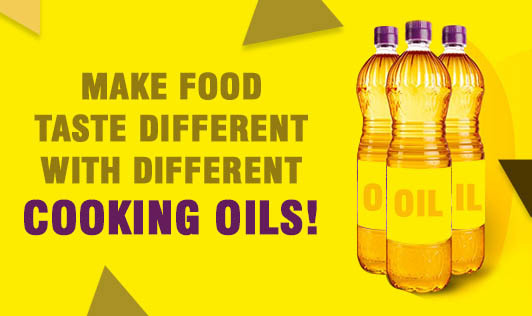 Make Food Taste Different With Different Cooking Oils! Creativity in our kitchen when it comes to cooking never takes a back seat. Whether you are deep frying, shallow frying, sautéing for a quick stir fry or tossing together for a salad dressing, it is important to know which oil suits the dish you are cooking best. We are generally overwhelmed by the varieties of cooking oil available in our grocery store. Let's uncover the best uses of some popular cooking oils. Cooking oil is a food commodity and is prone to spoilage when exposed to air, temperature and moisture. Store cooking oils in cool, dark and well-fitting containers. • For deep frying, use oil that can handle high heat. These include oils like peanut oil, palm oil, sesame oil and avocado oil. • Shop for oils at a specialty market where you can see a different range of oils. • Look for fat content of the oil: All oils are fats, but few oils are made up of good fats. Look for oils with high MUFA and zero trans fatty acids for a healthy heart and to regulate cholesterol levels. Olive oil: Extracted from Olives. This oil has high levels of antioxidants, and is suitable for every person. Best use: Salad dressing and for coating pastas. Sunflower Oil: This oil is a great source of Vitamin E when compared to any other oil that is present in the natural form. Best use: For sautéing, light cooking and as a base for salads. Safflower Oil: Safflower oil is rich in both vitamin E and Omega 6 fatty acids. Best use: For sautéing and light cooking. Peanut oil: This oil is highly stable and has a long shelf life. Peanut oil gives a unique flavor to the food. Best use: It's high smoke point makes it ideal for deep frying. It is also good to use for shallow frying, and sautéing. Coconut Oil: This oil increases good cholesterol in the body. Studies have also linked this oil to weight loss. Best use: For light cooking, baking, and for smoothies. Mustard Oil: Mustard oil is high in MUFA and has fair amount of omega 3 and omega 6 fatty acids. Best use: For shallow frying, pickling, light cooking and sautéing. Remember, any oil in excess can be harmful to health. So, use the right oils in the right way!